Browns Say Hello, Saints Say Goodbye! What do you get with free agency and no salary cap? 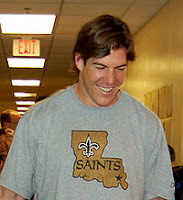 Scott Fujita (linebacker) bidding the Saints adieu and bonjour to the Browns. All weekend I've been catching bits and pieces of player movements, prices being paid and many teams saying goodbye to beloved players. It's the nature of the beast and this time of year for the NFL is just as intense as the first game of the season. Drew Brees took to his Twitter to say goodbye to Fujita. My initial reaction was wow, Cleveland Browns huh? They must have paid a lot for him to leave the Saints and go to that team, but once you have that Super Bowl ring, I guess you can be a little bit more promiscuous with where you go and command a bigger rate. I usually refrain from writing anything about the Patriots because there is no other team and set of fans that I can't stand even more, but they paid big money for a 5 yr contract with Vince Wilfork, making him the highest paid nose tackle. With no salary cap, I really do feel that the NFL may become like the MLB, where basically those with the most money, get the best players and hence have the best team. That's how it usually goes doesn't it? With Jamal Williams gone, LT gone, Cromartie Gone, Merriman maybe gone (tendered), Darren Sproles good chance of being gone (tendered) and who knows who else.. the only recognizable remnants of the Chargers include Rivers and Jackson. Oh and of course good ol Norv Turner. I'll keep posting as it happens, good luck to all of you and your favorite teams, unless you're a Patriots or Raiders fan then I hope you all burn. (I'm not that mean, so maybe just a bad sunburn will suffice till season starts).